Henry Page is a relatively typical teenage boy in high school, although rather than being a teenage horn dog Henry fancies himself as more of a hopeless romantic so he has never had a proper girlfriend. When Grace Town walks into his class with her limp, oversized boyish clothes and lack of personal hygiene Henry thinks of her as strange but when they are forced to edit the school newspaper together they soon find that they have feelings for each other, but like most relationships, things are certainly not straight forward especially when Grace seems so broken. Our Chemical Hearts not only deals with the peaks and pitfalls of teenage relationships, but it also deals with a much heavier subject too, death and how it can affect a person. This is not something I've seen tackled as heavily in other books so it made for a really great twist to the story. The book is also quite slowly paced which I think fits in well because death is such a heavy topic you really don't want it to feel like anything has been rushed. I have to warn you now though, this book will seriously pull at your heartstrings time and time again, not to say that there isn't plenty of heartwarming moments in here too which just adds to the emotional rollercoaster. 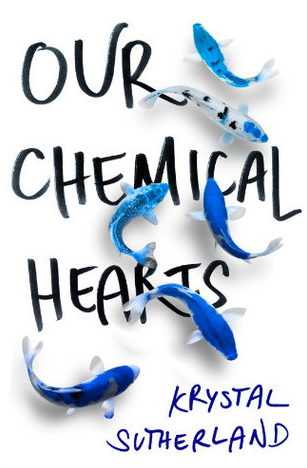 I've seen a lot of people compare Our Chemical Hearts as a mash up of Rainbow Rowell and John Green and I think that is a perfect summary for this style of book. This is Krystal Sutherlands debut novel and I'm very excited to see what she comes out with next. Although this book is not revolutionary I really enjoyed reading this and found it very cathartic. A great one for any contemporary fans.